Greetings, I offer functional medicine consultations from the theoretical view of Tibetan medicine, with a focus on epigenetics and biochemical nutrition. I have had an interest in Asian culture since a young girl and Tibetan medicine since 1987 when I first traveled to Tibet. The majority of my career has focused on basic research of multiple sclerosis with a focus on Tibetan medicine. A near-lethal encounter with a black widow spider redirected me into a broader focus and introduced me to functional medicine, through which I have helped those with autoimmunity, autism spectrum, mood disorders, cardiovascular disease and others, including families. I particularly enjoy working with those going through the process of spiritual emergence after near-death experiences and trauma. I began my work life early on as an ICU nurse and am also drawn to end-of-life care. As a PhD scientist in physical chemistry with a focus on quantum theory, magnetic resonance and neurobiology, I am intrigued by the number system of Tibetan medical theories. In our beginning work, Dr. Dhondup and I have shown that Tibetan medical theories are consistent at the microscopic level and continue our pursuits in those areas through our non-profit work. You may also contribute by offering a Gift for our integrative research of functional Tibetan medicine and physics. Clinical Consulting in Integrative Functional Medicine, systems biology medicine. • Evaluation of biochemical imbalances with epigenetics and functional biomarkers. • Emphasis on general internal medicine and family medicine, all ages, with experience in autoimmunity, toxins, neurotransmitters, moods, autism spectrum, neurodegenerative, cardiovascular and respiratory disorders, cancer, hormones, infertility, and end of life care. • Integration of Functional and Tibetan medical theories. • Comparison of outcomes and costs of preventive health strategies for management of chronic health conditions, including Multiple Sclerosis. Independent Study of the intersection of science and spirituality, health policy, Tibetan medicine, and integrative medicine. Spirit House, Woodside, CA. • Research of Tibetan Medicine with a focus on longevity, neurodegenerative disorders, immunity and autoimmunity, chronic disease, infertility. • Education, Research, Conservation of Tibetan Medicine. • Integrative research of neurodegenerative disorders, with approaches in physical chemistry, bioengineering, central nervous system cultures, medicinal plants and Tibetan Medicine. • Characterization of myelin structure and changes in multiple sclerosis with approaches in physical chemistry and bioengineering, including magic angle spinning NMR spectroscopy, MRI microscopy, HPLC and GC analyses of myelin lipids, Langmuir isotherms and fluorescence microscopy, atomic force microscopy, x-ray reflectivity, confocal microscopy of myelin formation, atomic force microscopy of human brain progenitor cell differentiation, myelin bioreactor design. • Advisor to honor’s theses in neuroscience. 1999-pr Research on Traditional Tibetan Medicine in collaboration with Dr. Lobsang Dhondup. Research focus on longevity, neurodegenerative disorders, immunity and autoimmunity. education. Greenhouse medicinal plants included. 1994 - Northern California National Multiple Sclerosis Society, Conceptualized Annual Meeting "The Mind-Body Connection" and chaired session "Positive Daily Living: Complementary Methods for Enhancing Well-being"
• Traveled, worked, and studied for one year in China, Tibet, and India. • Worked with Ministry of Health of Belize to teach health care while teaching English as a second language to refugees; independent study of Mayan medicine. 1975- pr Studies in nutrition, exercise, massage, herbalism, meditation, yoga, Ayurveda, acupuncture, t'ai chi, qi gong, Tibetan medicine, somatic education including Rolfing and Hanna Somatics, pranic healing/energy medicine, Functional Medicine, world traditional medicines. Benjamin Ohler, Ph.D., Chemical Engineering, UCSB, February 2003. The role of lipids in normal myelin structure and diseases of myelin. Primary research advisor. 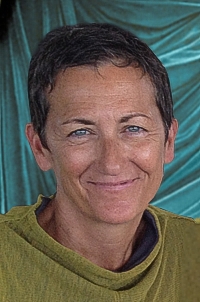 Julie Burgher, M.S., Ecology, Evolution and Marine Biology, UCSB, June 2001. The Role of MAG in Myelination: Friend or Foe? Primary research advisor. Husted C. Structural insight into the role of myelin basic protein in multiple sclerosis. Proc Natl Acad Sci, 2006; 103:4339-4340. Hu Y, Doudevski I, Wood D, Moscarello M, Husted C, Genain C, Zasadzinski J, Israelachvili J. Synergistic roles of lipids and myelin basic proteins: Force measurements between and structural imaging of model myelin membranes, Proc Natl Acad Sci, 2004; 101:13466-13471. Ohler B, Graf K, Bragg R, Lemons T, Coe R, Israelachvili J, Genain C, Husted C. Role of Lipid Interactions in Autoimmune Demyelination, BBA Mol Basis Disease, 2004; 1688:10-17. Graf K, Husted C, Baltes H, Ahrens H, Helm CA. Structure of hydroxylated galactocerebrosides from myelin at the air-water interface, Biophys J, 2002; 82:896-907. Ohler B, Revenko I, Husted C. Atomic force microscopy of nonhydroxy galactocerebroside nanotubes and their self-assembly at the air-water interface, with applications to myelin, J Struct Biol, 2001; 133:1-9. Husted C, Matson GB, Adams D, Goodin DS, Weiner MW. In vivo detection of myelin phospholipids in multiple sclerosis with phosphorus magnetic resonance spectroscopic imaging, Ann Neurol 1994; 36:239-241. Husted C. Contributions of neuroimaging to multiple sclerosis, Current Opinion in Neurology 1994; 7:234-241. Husted C, Goodin DS, Maudsley AA, Hugg JW, Tsuruda JS, Matson GB, Weiner MW. Biochemical alterations in multiple sclerosis lesions and normal appearing white matter detected in brain by in vivo 31P and 1H magnetic resonance spectroscopic imaging, Ann Neurol 1994, 36:157-165.
metabolites in human brain with 3D magnetic resonance spectroscopic imaging, Magn Reson Imag 1994; 12(4):661-667. Montez B, Oldfield E, Urbina JA, Pekerar S, Husted C, Patterson J. Editing 13C-NMR spectra of membranes. Biochim Biophys Acta 1993; 1152:314-318. Husted C, Montez B, Le C, Moscarello M, Oldfield E. Carbon-13 "magic-angle" sample spinning nuclear magnetic resonance studies of human myelin, and model membrane systems. Magn Reson Med 1993; 29:168-178. Hugg JW, Laxer KD, Matson GB, Maudsley AA, Husted C, Weiner MW. Lateralization of human focal epilepsy by 31P magnetic resonance spectroscopic imaging. Neurology 1992; 42:2011-2018. Meyerhoff DJ, Maudsley AA, Husted C, Weiner MW. Magnetic Resonance Spectroscopic Imaging. MR Quarterly 1992; 2:47-52. Forbes J, Husted C, Oldfield E. High-field high-resolution proton "magic angle" sample-spinning nuclear magnetic resonance spectroscopic study of gel and liquid-crystalline lipid bilayers, and the effects of cholesterol. J Amer Chem Soc 1988; 110:1059-1065. Rabideau PW, Day LM, Husted C, Mooney JL, Wetzel DM. Stereochemistry of metal-ammonia ring reduction of aryl carboxylates and ketones and NMR conformational analysis of the dihydro aromatic products. J Org Chem 1986; 51:1681-1686. Rabideau PW, Wetzel DM, Husted C, Lawrence JR. The 13C NMR conformational analysis of 9,10-dihydroanthracene monoanions. Tetrahedron Letters 1984; 25:31-34. Rabideau PW, Husted C, Young DM. Metal-ammonia reduction of 1-acetylnaphthalenes. J Org Chem 1983; 48:4149-4150. Husted C. and Dhondup L. Bridging the Gap Between Science and Traditional Medicine: Microscopic and Macroscopic Agreement of Three nyes pa Descriptions of Multiple Sclerosis. In Mingji Cuomu, Sienna Craig, Francis Garrett and Mona Schrempf (eds. ), Studies of Medical Pluralism in Tibetan History and Society. (Proceedings of the 11th Seminar of the International Association for Tibetan Studies, Bonn 2006). Andiast: International Institute for Tibetan and Buddhist Studies GmbH (IITS), 2011. Husted C and Barrett B. Echinacea angustifolia therapeutics and safety profile, in Echinacea angustifolia Standards of Analysis, Quality Control and Therapeutics, Roy Upton (Editor), American Herbal Pharmacopoeia, 2010. Husted C and Dhondup L. Tibetan medical interpretation of myelin lipids and multiple sclerosis. Ann NY Acad Sci, 2009; 1172: 278-296. Dhondup L and Husted C. Regeneration and Tibetan medicine. Ann NY Acad Sci, 2009; 1172: 115-122. Husted C, Pham L, Hekking AMA, Niederman RS. Improving quality of life for people with chronic disabilities: the example of t’ai chi and multiple sclerosis, Alt Therap Health Med, 1999; 5:70-74. Ohler, B.; Graf, K.; Lemons, T.; Coe, R.; Jahangir, S.; See, W.; Genain, C.; Husted, C. American Society for Neurochemistry. Myelin lipid research using Langmuir monolayers. J Neurochem 1999; 72:S15. Husted C, Nguyen M-H, Hauser SL, Genain, CP. Changes in myelin lipid fatty acid unsaturation during EAE in the common marmoset detected with carbon-13 magic angle spinning NMR spectroscopy. Neurology, 1995; 45:A211. Husted CA and Post JFM. Decreases in myelin lipids in multiple sclerosis normal appearing white matter detected with carbon-13 magic angle spinning NMR spectroscopy. J Neurochem 1995; 64:S3C. sclerosis lesion and normal white matter detected in brain by in vivo 31P and 1H magnetic resonance spectroscopic imaging. Neurology 1993; 43:A182. Meng X, Husted C, Cheng J, Cui Y, Chen Y. Structure of norhendosin, a spirosecokaurene diterpenoid from Rabdosia henryi, Department of Chemistry, Lanzhou University, China, 1987. Eastern Medicine. Draper University, San Mateo, CA, June 13, 2012. Rafts and domains in MS normal-appearing myelin and acute demyelination. Rafting and Misrafting Myelin with a Look to Autoimmunity, MARIE Network of the European Science Foundation. Giovinazzo, Italy, September 28–October 1, 2006, invited speaker and session chair. Tibetan medical interpretation of myelin and multiple sclerosis. Tibet House U.S. & Columbia University Integrative Medicine Program, Longevity & Optimal Health Conference: Integrating Eastern & Western Perspectives, September 18-21, 2006. Synergistic roles of lipids and myelin basic proteins: Force measurements between and structural imaging of model myelin membranes. Myelin Structure and its role in Autoimmunity II, MARIE Network of the European Science Foundation. Potenza, Italy, May 1-5, 2005, invited speaker and session chair. Tibetan medicine interpretation of myelin and multiple sclerosis. Department of Anthropology, History and Social Medicine and Osher Center for Integrative Medicine. Workshop on Tibetan Medicine. University of California, San Francisco, May 2004. Tibetan medicine interpretation of myelin and multiple sclerosis. Second International Congress on Tibetan Medicine. Washington, DC, November 2003. Integrative approaches to the study of Multiple Sclerosis with an emphasis on the study of medicinal plants. University of California, Santa Barbara Restoration Ecology Seminar, February 2003. Overview of Tibetan Medicine and Multiple Sclerosis. Ball Memorial Family Practice Residency Program, Indiana University, November 2002. Structural characterization of myelin in multiple sclerosis. Southern California IEEE Biomedical Engineering Society Annual Meeting. Anaheim, CA, September 2002. Research overview of integrative approach to problem solving. University of California, QUEST Mentorship Program, August 2002. Progress toward understanding multiple sclerosis. University of California, Santa Barbara Registrar’s Office, Santa Barbara, CA, June 2002. Progress toward understanding multiple sclerosis. University of California, Santa Barbara, Continuing Education for Student Health Center Physicians, May 2002. The physical chemistry of myelin in multiple sclerosis. Huntington Medical Research Institute, Pasadena, CA, April 2000. Imaging studies of myelin and multiple sclerosis. California State University, Northridge, CA, February 2000. Progress toward understanding multiple sclerosis. Schulte Research Institute Annual Meeting, Santa Barbara, CA, November 1998. A multidisciplinary approach to multiple sclerosis. Department of Psychology, Graduate program in biopsychology, University of California, Santa Barbara, October 1997. The physical chemistry of myelin. Institute for Theoretical Physics and Materials Research Lab Summer School, University of California, Santa Barbara, CA, July 1997. Bioengineering characterization of myelin and changes in multiple sclerosis. Centaur Pharmaceuticals. Sunnyvale, CA, July 1997. Bioengineering characterization of myelin and changes in multiple sclerosis. UCLA Neuroimmunology Research Group. June 1997. Bioengineering characterization of myelin membranes and changes in neurodegeneration. Department of Chemical Engineering, University of California, Davis, May 1997. Magic angle spinning NMR studies of myelin lipids. Cottage Hospital Annual Research Symposium, Santa Barbara, CA, January 1997. Bioengineering characterization of myelin and changes in multiple sclerosis. UCSF Neuroimmunology research group, November 1996. Characterization of myelin and changes in neurodegeneration - a bioengineering approach. Department of Chemical Engineering, University of California, Santa Barbara, October 1996. Magnetic resonance studies of demyelination in MS and EAE. Neuroscience Research Institute Annual Symposium, University of California, Santa Barbara, June 1995. Magnetic resonance studies of myelin lipids in multiple sclerosis. Neurosurgery and Neurology Grand Rounds, Cottage Hospital, Santa Barbara, CA, October 1994. Magnetic resonance studies of demyelination in multiple sclerosis. Neuroscience Research Institute Seminar Series, University of California, Santa Barbara, CA, December 1994. Magnetic resonance characterization of multiple sclerosis normal appearing white matter. Department of Human Biological Chemistry and Genetics, University of Texas Medical Branch at Galveston, November 1993. Magnetic resonance studies of myelin lipids. Magnetic Resonance Science Center, University of California, San Francisco, September 1993. Proton and phosphorus magnetic resonance spectroscopic imaging of multiple sclerosis. Neuroradiology Research Conference, University of California, San Francisco, August 1993. Molar quantitation of in vivo proton metabolites in human brain with 3D magnetic resonance spectroscopic imaging. In Vivo Magnetic Resonance Workshop, University of California, San Francisco, 1992. Normal appearing white matter changes in multiple sclerosis detected by proton and phosphorus MR spectroscopic imaging. In Vivo Magnetic Resonance Workshop, University of California, San Francisco, 1992. Proton and phosphorus magnetic resonance spectroscopic imaging of multiple sclerosis. Neuroradiology Research Conference, University of California, San Francisco, July 1992. Proton and phosphorus magnetic resonance spectroscopic imaging of multiple sclerosis. In Vivo Magnetic Resonance Workshop, St. Louis, 1991. Solid state carbon-13 magic angle spinning NMR studies of normal and diseased myelin membranes. Membrane Seminar Series, University of Toronto, March 1990. Adsorption and Bridging Adhesion of Myelin Basic Protein with Cytoplasmic Model Myelin Membranes. American Institute of Chemical Engineers, Nashville, TN, November 8-13, 2009. Min Y, Kristiansen K, Boggs J, Husted C, Zasadzinski J, Israelachvili J. Interaction Forces and Adhesion of Myelin Lipid Bilayers as Modulated by Myelin Basic Protein. American Institute of Chemical Engineers, Philadelphia, PA, November 16-21, 2008. Husted C, Ohler B, Bragg R, Genain C, Israelachvili J, Revenko I, Zasadzinski J. The physical chemistry of myelin lipids in multiple sclerosis. Neuroscience Institute at Stanford, 2nd annual meeting, May 2-4, 2003. Kuszta B and Husted C. Non-invasive method of measuring distributed impedance of neuron fibers. Measurement Science Conference, 2002. Ohler B, Revenko I, Husted C. Atomic force microscopy of galactocerebroside nanotubes and their self-assembly at the air-water interface, with applications to multiple sclerosis. Presented at the Neuroscience Research Institute Annual Symposium, University of California, Santa Barbara, June 2000. Hu Y, Ohler B, Husted C, Israelachvili. Characterization of the adhesion between model myelin membranes by Surface Forces Apparatus. 2000 UC-System Biomedical Engineering Symposium, April 30-May 1, 2000, University of California, Davis. Ohler B, Revenko I, Husted C. Atomic force microscopy of galactocerebroside nanotubes and their self-assembly at the air-water interface, with applications to multiple sclerosis. Presented at the Materials Research Outreach Symposium, University of California, Santa Barbara, February 28 - March 1, 2000, received doctoral student award. Hu Y, Ohler B, Husted C, Israelachvili J. Stability of myelin structure as a result of varying membrane adhesion and lipid packing. 44th Annual Biophysical Society Meeting, February 12-16, 2000, New Orleans. Husted C. Overview of Research of Multiple Sclerosis. Presented at the Santa Barbara Public Library in collaboration with Cottage Hospital. Month of January 2000. Ohler B, Graf K, Lemons T, Medina M, Coe R, Genain C, Husted C. Alterations in membrane forming properties of myelin lipids may explain demyelinating process in multiple sclerosis. Presented at the Society for Neurochemistry annual meeting, New Orleans, March 1999, received doctoral student award. Husted C. Overview of Research of Multiple Sclerosis. Presented at the Santa Barbara Public Library in collaboration with Cottage Hospital. January 1999. Husted C, Ohler B, Bragg R, Lemons T, Wilson A, Pham L, Jahangir S, Detch J. The physical chemistry of myelin. Presented at Frontiers of Myelin Biology and Demyelinating Disease, Mystic, CT, July 1997, awarded most innovative approach to studying myelin. Husted C, Ohler B, Bragg R, Lemons T, Wilson A, Pham L, Jahangir S, Detch J. The physical chemistry of myelin. Presented at Langmuir Blodgett 8, Pacific Grove, CA, August 1997. Hong M, Schmidt-Rohr K, Lee YK, Husted C, Pines A. Investigation of polymers and lipids by chemical shift anisotropies in sample-hopping experiments. Presented at 35th Experimental NMR Conference, MP229, Asilomar, CA, April 1994. 31P and 1H magnetic resonance spectroscopic imaging. Presented at Advances in the Understanding and Treatment of MS, Boston, 1992. Duijn JH, Husted C, Matson GB, Maudsley AA, Weiner MW. Molar quantitation of in vivo proton metabolites in human brain with 3D MR spectroscopic imaging. Presented at 11th Annual Meeting of the Society of Magnetic Resonance in Medicine, p. 3807, Berlin, 1992. Husted C, Duijn JH, Goodin DS, Fein G, Dickinson M, Maudsley AA, Weiner MW. Normal appearing white matter changes in MS detected by H-1 and P-31 MR spectroscopic imaging. Presented at 11th Annual Meeting of the Society of Magnetic Resonance in Medicine, p. 1912, Berlin, 1992. Chung J, Husted C, Werbelow L, Oldfield E. Solid State NMR of Mobile Solids. Presented at 33rd Experimental NMR Conference, p. 124, Asilomar, CA, 1992. Husted C, Hugg JW, de Bie SH, Duyn JH, Matson GB, Maudsley AA, Weiner MW. 1H and 31P MR spectroscopic imaging (MRSI) of multiple sclerosis. Presented at Tenth Annual Meeting of the Society of Magnetic Resonance in Medicine, p. 83, San Francisco, 1991. Husted C, Montez B, Oldfield E. 13C magic angle spinning NMR dynamical studies of normal and diseased myelin membranes. Presented at Ninth Annual Meeting of the Society of Magnetic Resonance in Medicine, p. 1058, New York, 1990. Husted C, Shan X, Oldfield E. High-field, high-resolution 13C MASS NMR spectroscopy of model membranes and myelin. Presented at Eighth Annual Meeting of the Society of Magnetic Resonance in Medicine, p. 1096, Amsterdam, 1989. Husted C, Forbes J, Moran L, Shan X, Oldfield E. Solid state 13C MAS NMR of myelin. Presented at 30th Experimental NMR Conference, p. 85; Asilomar, CA, 1989. Shan X, Husted C, Knight C, Oldfield E. High resolution MAS NMR study of lipid bilayers and myelin. Presented at American Physical Society Annual Meeting, St. Louis, MO, 1988. NMR of lipids and membranes; and 17O cross polarization of inorganic solids. Presented at 28th Experimental NMR Conference, MF31; Asilomar, CA, 1987. BALM Foundation, Reweaving Our Health, Medicinal Garden Project, 2002-2003, principal investigator, $15,000. National Institutes of Health, Reproducible Feverfew Preparations for Migraine Trials, Grant Number: 1 R44 AT00770-01, 9/17/2001 - 11/30/2002, collaborator, $202,970. Unrestricted gift, Research at the Interface of Global Medicine and Neurodegenerative Disorders, with a Particular Emphasis on Multiple Sclerosis, 2000-2005, $500,000. Equipment Agreement: Atomic Force Microscope and associated supplies, Digital Instruments, Santa Barbara, CA, 2000-2002, principal investigator, $120,000. County of Santa Barbara Work Training Program, Salary support for four garden workers, including one supervisor, at the Medicinal Plant Project, April - June 2000, $15,000. University of California Biotechnology Special Opportunity Award for Young Investigator’s Program, 1999-2000, principal investigator, $15,000. Digital Instruments, Santa Barbara, CA, Support of doctoral student in Chemical Engineering and associated research supplies for atomic force microscope studies of myelin and multiple sclerosis, June 1999 - June 2002, $75,000. Anonymous donation for student support, 1999-2000, $10,000. Cottage Hospital Research Grant, An in vitro model of demyelination in multiple sclerosis, 1998-1999, principal investigator, $15,000. Dos Pueblos Ranch, Santa Barbara, CA, in-kind support of Medicinal Plant Project, 1998-2001, $30,000. UCSB Research Across Disciplines, Establishment of a Medicinal Plant Greenhouse, Gardens and Tissue Culture Facility, 1998-1999, $30,000. BALM Foundation, in collaboration with the Global Medicine Project at UCSB, funds for purchase and operation of a medicinal plant greenhouse, 1998-1999, $75,352. University of California Biotechnology Special Opportunity Award for Young Investigator’s Program, 1998-1999, principal investigator, $15,000. University of California, Santa Barbara, Howard Hughes Medical Institute Mentorship Program, funds for Biomedical Research Mentorship Program, 1997-1998, $20,000. University of California Biotechnology training grant: salary and fees for one Ph.D. student in Chemical Engineering at UCSB, 1997-1999, $33,732. Anonymous donation for research support, 1997-1998, $5,000. University of California Biotechnology STAR grant with Centaur Pharmaceuticals: A model of in vitro myelin modification in neurodegeneration. 1997-1998, principal investigator, $375,000. University of California, Santa Barbara, QUEST Mentorship Program, funds for Biomedical Research Mentorship Program, 1996-1997, $15,000. Research Grant, Institute on Aging, National Institutes of Health: NMR studies of myelin membrane fluidity in aging, 1996-1997, principal investigator, $50,000. Equipment Agreement: Langmuir trough, biohood and associated materials, USDA Center for Human Nutrition Research on Aging, 1996-1997, principal investigator, $30,000. Research Grant, National Multiple Sclerosis Society: Magic angle NMR evaluations of myelin membrane fluidity in MS and EAE, 1996-1999, principal investigator, $301,210. Cottage Hospital Research Grant, 1995-1996, principal investigator, $14,987. Research Planning Grant, National Science Foundation: Magic angle spinning NMR evaluations of myelin membrane development, 1995-1996, principal investigator, $18,000. Pilot Grant, National Multiple Sclerosis Society, 1995-1996, principal investigator, $21,000. Wellness Research Grant, MS Community Services, 1994, principal investigator, $1,000. Wellness Research Grant, MS Foundation, 1994, principal investigator, $5,000. Research Grant, National Multiple Sclerosis Society: MR spectroscopic imaging of normal white matter axonal density and myelin in MS, 1994-96, co-investigator, wrote grant, $233,000. Advanced Postdoctoral Fellowship, National Multiple Sclerosis Society: In vivo magnetic resonance characterization of brain phospholipids in MS, 1993-1994, $37,000. Instrumentation grant, Multiple Sclerosis Foundation, 1993, principal investigator, $4,300. Research Grant, National Multiple Sclerosis Society: MR spectroscopic imaging of normal white matter axonal density and myelin in MS, 1993-1994, co-investigator, $58,800. Pilot Grant, Research Evaluation and Allocation Committee, University of California, San Francisco: Microanatomic correlates of brain myelination as assessed by proton and carbon-13 nuclear magnetic resonance, 1992-1993, co-investigator, $15,000. Postdoctoral Fellowship, National Multiple Sclerosis Society: In vivo magnetic resonance studies of phospholipid metabolism in MS, 1991-1993, $56,600.